So I’m part of a couple of crochet groups on Ravelry that host crochet-alongs. What this is, exactly, is that each month a particular pattern is chosen and the whole group makes it. It’s really fun because you get to see so many interesting interpretations of a pattern. The other thing that I really like about it is that there are so many blocks or patterns that I would normally not choose on my own, but in making them I’ve learned all sorts of new techniques. And it’s expanded my repertoire, too. One in group in particular that I just finished working on, the 2013 BAMCAL (Block-a-Month Crochet Along), is one that I really enjoy doing. Basically you choose your colors at the beginning of the year (or whenever you join in, or whenever, really, because there are no rules), and then at the beginning of each month, you make a block or three (there are three options per month). When the end of the year comes around, you have yourself a lovely afghan. These were my grandmother’s cherry blossoms – I remember these in her home 30 years ago! Don’t they go nicely? I chose my colors because I’ve been really into pink lately. Pink is so lovey and cheery, and over the winter I painted my living room and dining room pink. Right at that time, I was deciding on the final color selection, so I thought it would go well with the pink walls and the woodwork and such. It wasn’t until later that everyone started pointing out that it looked like Neapolitan ice cream! Well, that’s not too bad either! Here are my squares from March. 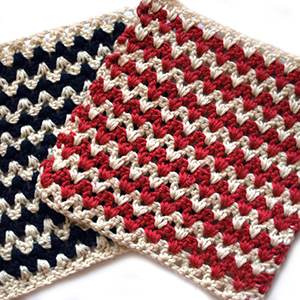 The first one is called Princess Square, and you can find the pattern free here. 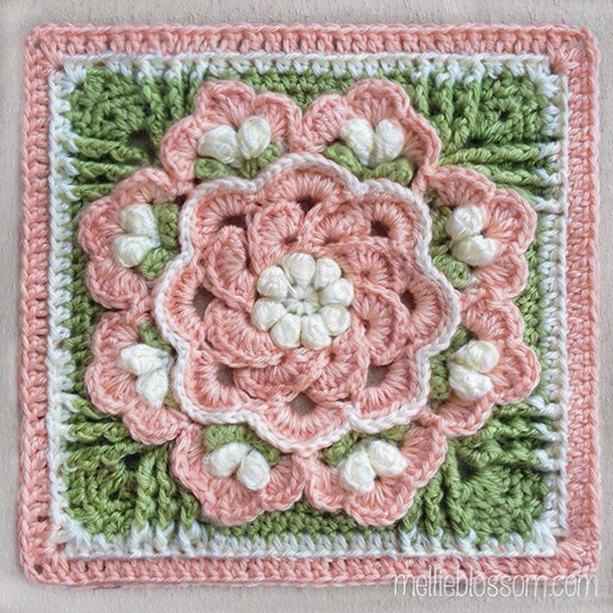 The second one is called Simple 10-Petal Afghan Square, and here’s both my Ravelry notes and the link to the free pattern. And this third one is actually a pattern for a 6-inch square, of which I made 4 and then stitched them together to make a 12” square. It’s called Forever Lace Block (free pattern here). Mine ended up being way under 6” so I was browsing around for a nice looking joining technique and I came upon this joining technique. Obviously, I embellish mine and stray from the patterns from time to time. But I think that’s part of the fun too – it’s more like interpreting it into my own style. I haven’t decided exactly where I’ll be using this afghan when the CAL is over. Last year I ended up giving the 2012 afghan away to a dear lady who helped me tremendously. I give away or donate so many of my crochet work; I’m thinking I might just hang onto this one.